It's Batman's 80th anniversary, and Brian Michael Bendis isn't letting the milestone occasion go by without celebrating it in a very Superman way. There is so much going on in Action Comics #1009 with everything surrounding the Leviathan mystery, but one spread about halfway through the issue has a little fun in Gotham that could not have been timed any more perfectly considering it hit stores around Batman’s big day. As Superman flies all around the globe trying to make heads or tails of the Leviathan threat, he makes a pit stop in Gotham to visit his old Justice League buddy Batman. But Bruce Wayne isn't around—he "is in the middle of a situation with the Riddler," according to Alfred. But that doesn't mean that Superman leaves the Batcave empty-handed. 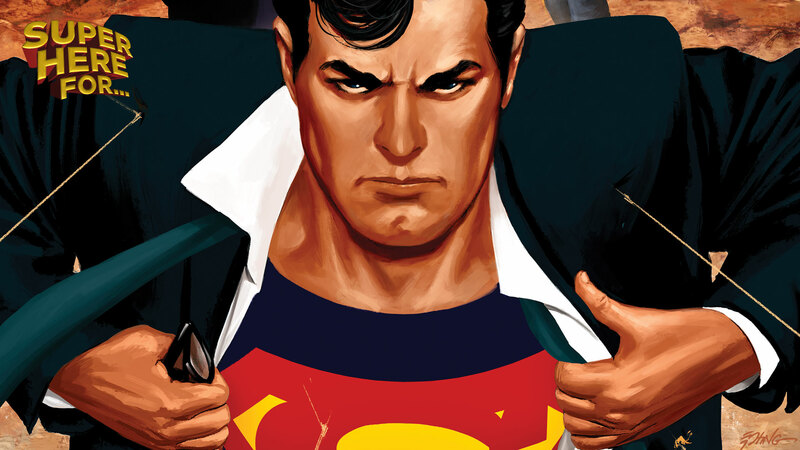 Superman needs some help running forensics on the note he found in Talia al Ghul's former base in order to get some kind of edge on the force that's been quietly and not-so-quietly taking out all the shadowy organizations in one massive coordinated attack. And the funny part is he doesn't even need Bruce to do it—Alfred handles it all. He even acts as a competent sounding board for Superman as he talks through his thoughts on whether or not Talia could be behind everything. Alfred can finish Superman's sentences, provide new ideas and generally go toe-to-toe with Superman himself, intellectually speaking. And without Batman there to pull focus, the interaction allows Superman to see Alfred's true potential. That's why, as he's flying away, he tells Alfred, "You don't get enough credit." And Alfred's reply is what had me in absolute hysterical laughter: "It's because he has me trapped in this cave all day and night." Alfred's got some sass! It's a small moment of levity in an otherwise intense and packed issue full of dark drama and mystery, but it's one that I can't stop thinking about. Superman just kind of quietly owns Batman by treating Alfred as an equal instead of a butler, and he doesn't take him for granted. The mutual respect between the two men allows Alfred to open up in a way that I personally haven't seen before (although to be honest, I'm not well-versed in Batman comic books). This isn't a dig at Batman at all per se, because Superman isn't that petty of course. But it's hilarious to see the difference in how Superman treats Alfred vs. how Batman treats Alfred. Of course, Superman pays more respect to the man who keeps the entire Batcave running! It's how Superman treats anyone, regardless of their station. And when's Batman's away, the dynamic of Alfred shifts in a fascinating way. What a way to celebrate the big Batman anniversary in a Superman book! Something else that stood out in this month's Action Comics was how much Jimmy impresses Lois and Clark. It's not just his stealth sleuthing of the Kobra Cult that proves his talents, either. It's also the way he takes everything in stride. I mean, he literally wakes up in Superman's new Fortress of Solitude next to a knocked-out Amanda Waller and Lois Lane getting her hand treated by a floating robot and all he asks is where's the coffee. This kid can clearly handle anything. And how sweet is it that Jimmy's first thoughts amidst all the shadowy organization chaos is to make sure that Superman found and saved Clark Kent? Sweet, sweet Jimmy Olsen. Never change. And now we're about to get British bearded Superman going undercover in the international spy ring Spyral to figure out what the heck is going on with Leviathan?! It really doesn't get any better than this. Thanks to some kryptonite technology, Lois is able to change Clark into Chaz Donen, an agent of Spyral, and she's ready to go undercover as Andi Donen. No matter what happens from here, I'll never get over the image of seeing Clark as a beefy bearded British dude…wait, that sounds eerily similar to Henry Cavill. Maybe this isn't as wild as I initially thought? Either way, this Leviathan mystery is about to get a whole lot more interesting as we finally get new information in an exciting undercover adventure. Action Comics is upping the action, and I can't wait to see what happens next.